Wield a powerful new weapon in Battle Royale and watch your aim with a returning weapon in Save the World. A Mythic melee weapon that deals big damage and destroys structures! Look for it at Polar Peak. 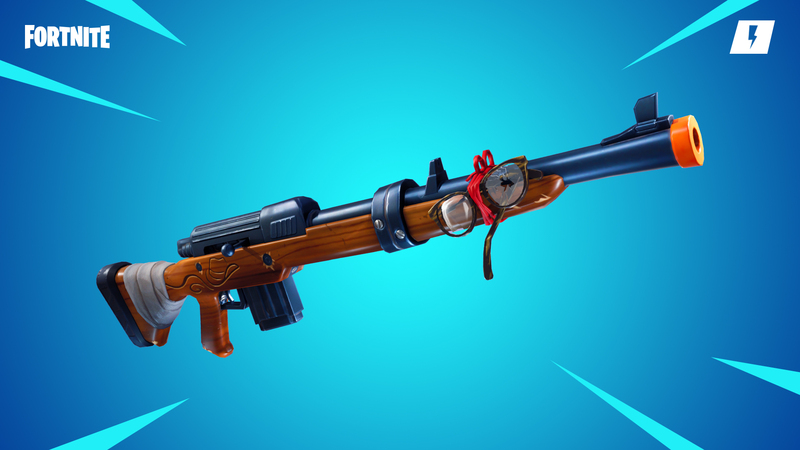 Accurate and slow firing rifle that rewards headshots! Let your imagination go wild with Fortnite Creative. Islands available for all players on December 13! Players are no longer brought to the Battle Royale lobby when clicking “Creative” in the game mode select screen. The only weapons in this mode are Shotgun variants. Other Shotgun variants are spawned as floor loot. The Storm moves in more quickly than normal at mid to late game. This Mythic melee weapon can be found on Polar Peak. Primary Fire delivers a powerful sword slash. It deals big damage to enemies and destroys structures in one blow (75 damage to players). Alternate Fire allows the player to leap great distances, destroying objects in its path. Upon landing, it delivers damage and a knock-up to nearby players (25 damage). The first player to pull the Infinity Blade from its pedestal will be instantly healed to full Health and Shields. 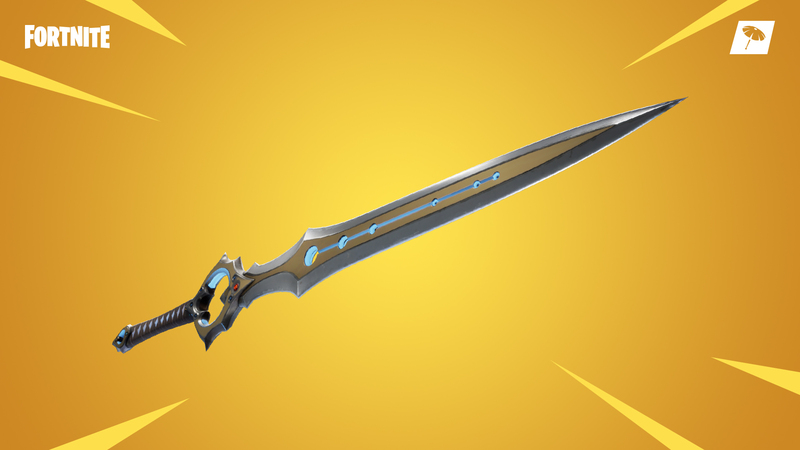 Only one Infinity Blade will appear per match. When a plane is shot down, the driver and all passengers of that plane will now take 25 damage from the explosion. Speculative fix for players moving after being eliminated. Fixed players being ejected from vehicles if they lost the icy feet effect. New 5th Island to build on. Provides the exact block that appears in Battle Royale where your creation could appear. Added 4 featured island Rifts. Featured islands will be changed over time as we feature the communities creations. Featured maps can be played the rules are set by the creator. Also, use the featured rifts to enter codes from other creators. Use codes to load creations that have been shared with the Island Code system. Initially, only a limited number of players in the Support a Creator program will have access to this feature. Over time we will expand the number of players that can publish islands as we polish this feature. To use a code, go to a Feature Rift and select “Enter Code” and follow the instructions. Post your creations to Reddit, Youtube, Twitch, or any of our other social channels! We may reach out and provide you the ability to publish your creation. Fixed an issue where respawning on Creative Hub could cause your player to leave the Island. Fixed various problems with Island Rifts not functioning correctly. Fixed Island Rifts not showing the correct Island name and player count in some cases. Fixed an issue that prevented player inventory from being reset when returning to Creative Hub. Fixed players appearing to fall through the ground in Replays when teleporting between islands. Fixed bug where the same friend’s server could appear multiple times in Creative server select. Fixed an issue that prevented players from placing building tiles on certain islands. Fixed an issue where players would not be able to spawn on your island when building tiles or props were in the way. The Obstacle Course gallery was split into four separate gallery Prefabs: Floors, Walls, Roofs & Stairs and Parts. New props were added to the Parts gallery. Go check it out! This gallery contains props that cannot be destroyed by weapons. New indestructible props and building tiles were added to this gallery Prefab. A few other Prefabs were updated with new building tiles and props. New: Item Spawner - Drop any item on this device to have it spawn one item at a time during games. New: Player Checkpoint Plate - Run across the checkpoint during a game and the next time you die you’ll respawn there. Player Spawn device can now be set to be an Island Start instead of a game start. This can be used to set where players arrive when they visit your island when not in Play mode. Fixed issues with multiple devices able to be placed on top of one another. Fixed Damage Rails being able to be placed on top of themselves. Fixed vehicles not being removed when their Vehicle Spawner is deleted. Fixed a problem that could cause devices to malfunction after being saved and loaded. Fixed certain devices becoming indestructible after loading your Island on a new server. “Starting Health” can now be set to “Invincible”. This prevents players from taking any damage on your island. This can be disabled to prevent island structures from being damaged in game. Has no effect on structures built by players during the game. When enabled, players will not be able to place structures while a game is active. When stopping a game, players are now returned to where they were before the game started. Player inventory is now reset when a game is started and also after it finishes. Fixed games being called “Minigames” in the UI in some places. Fixed eliminated players respawning on the same spawn pad in some cases. Fixed the “Down But Not Out” game setting not functioning correctly. Fixed players not being able to damage structures in game after editing privileges were revoked by the island owner. Fixed a bug where disabling falling damage would not be remembered when loading your island. Collision can now be turned on and off when moving props. Toggle collision using V (Hold) on a desktop, or D-Pad Left (Hold) on a controller. Snap now uses better settings for each individual prop. This allows props to align better to the Fortnite world grid. Your phone’s settings are now remembered as you move between islands, respawn, or play games on islands. Vehicles can no longer be deleted while players are using them. Added some additional sound effects when toggling options on the phone. Fixed props and building tiles being able to be placed outside of the island’s saveable area. Fixed props sometimes not placing exactly where the hologram preview shows it will when the Drops option was enabled. Fixed an issue with grid snap where props would not actually align to the grid when placing them down quickly. Fixed various problems when interacting with mirrored building tiles. Fixed some issues with placement of props being denied unexpectedly. Fixed an issue where props could vanish after you pick them up. Fixed some props that were not able to be moved using the Phone. Fixed hologram animations not playing on certain props when you pick them up. You can now switch to Fly while your Glider is deployed by double-tapping the Jump button. Holding down the Jump button on will now consistently fly upwards, even on a keyboard. Improved Fly animations, especially when using items or interacting. Fixed Bouncers being destroyed when flying on top of them. 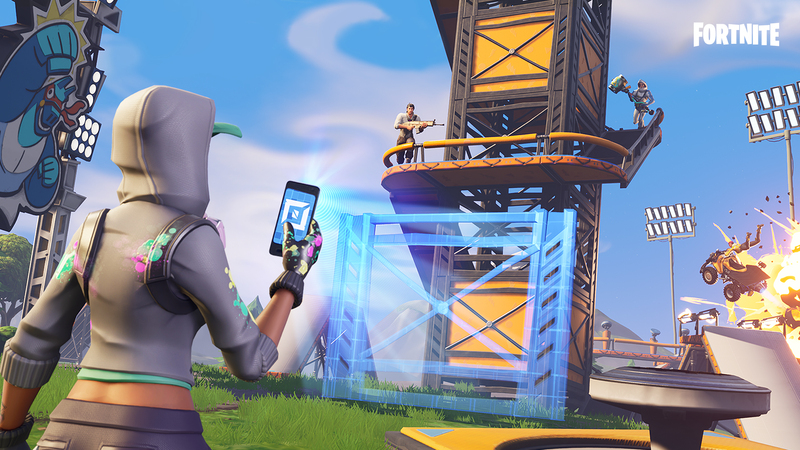 Fixed certain Devices not affecting respawned players who were eliminated while flying. Players will now be on the same team (and voice channel) when entering a server. Players who join a session in progress will now always be added to Team 1. Players are now spread evenly between available team spawns when possible. Players on the same team will now see team identifiers during a game. Removed redundant Team Spawn Pads option. Fixed players not all starting on the same team when first entering an Island. Fixed players not being on correct teams when starting a game. Fixed players being able to switch teams while in the middle of a game. Fixed players not being able to switch to specific teams in some cases. Fixed not being able to stack Port-a-Fortress grenades in Creative. Added a new tutorial pop-up to inform users about changing island permissions when another player joins the session. Players can no longer join your session in progress when your party is set to private. Fixed wrong Creative server being selected in some cases when choosing a server using a controller. Interacting with chests and Supply Llamas now takes the intended amount of time. Fixed the Creative Inventory not being displayed while skydiving or gliding. Fixed the wrong number of players showing next to names in the friend list. Fixed friends’ servers showing on Creative server select after they become empty. Fixed various issues with friend status in Creative and player counts. Fixed being able to access Creative Inventory when in the Creative Hub in certain cases. Improved the load times of island content when first starting a server. To improve server performance, the maximum number of Vehicle Spawners on an island has been limited to 32. Reduced memory usage when switching between Islands on the same server. Improved performance of particle systems with large numbers of placed traps. Added a new button that toggles Collision on the Phone. Added new states to some creative buttons to make their actions more clear. Fixed the “Memory Used” bar being covered up by other mobile UI. Storm Shield Defenses no longer grant reduced primary rewards if the 80% health bonus objective is failed. Accurate and slow firing air rifle that has a massive headshot bonus. Remember to always wear your eye protection! Available from December 12 at 7 PM ET until December 19th 7 PM ET.